Rhyd-y-Groes Wind Farm has received planning consent from Anglesey County Council to be repowered. The current 24 turbine site, built off the north-west tip of Anglesey has been generating power for 24 years making it Wales’ oldest wind farm. Plans to replace the current 24 turbines with 11 new turbines were submitted to Anglesey Council in April 2015. Once constructed, the proposed 9.9MW repowered site will be able to produce more power than the currently installed 24 turbines. The farm is owned by TPG Wind Ltd, a joint venture between E.On and Eurus Energy. 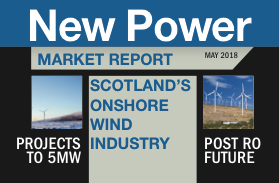 Subscribers: login to search and sort the New Power Database. Includes ten data points – size, status, CfD/CM contracts, location etc – on around 2000 UK power projects.